See it published on HuffPost. This piece was promoted to the front of the Politics page Huffpost UK website, reaching millions of readers. Most national websites offer similar advice for bloggers, centred around being specific; keeping the subject narrow. But when everyone does this, we can lose a broader perspective. You could say that’s for books and docs, but come on let’s be realistic – I’m a uni student. So I had this whacky idea that for my first blog of the year, I’ll be defiant. I mean, okay I’ll write specific pieces throughout the year on issues raised here, but for now here’s my window from a failed generation: modern Britain, 2018. So the festive season is over. Except, for the 128,000 homeless children in Britain, this week isn’t much different from last week or the week before that. Even the goodwill of volunteers at homeless shelters over Christmas cannot completely compensate for knowing that come January a profound isolation only returns. At PMQ’s in December, our Prime Minister basically denied the existence of these children, let alone beginning to address them. At least one in every 200 people in Britain are homeless. In my hometown of Barnstaple last week, a homeless man had written ‘HOMELESS NOT HOPELESS’ on the pavement. Life is also a daily struggle for those trapped in barely habitable social housing. Many of them are single mothers just trying to raise their kids. Maybe the reality is too hard to face for our government, but it’s what happens after seven years of a free market dogma that simply does not care about the most vulnerable. As journalist Robert Peston recently put it, when nurses are having to go to foodbanks that’s when you know it’s a broken society. Those nurses have trained hard, many of them will have families and care passionately about patients. This is the pinnacle of all that? But what we’re talking about is a bankrupt social order because those nurses aren’t only personal victims. No, they join doctors and paramedics in working with minimal resources, under hardly bearable pressure. But there’s plenty of money concentrated at the top for profit. Just look at the amount of private finance initiatives (PFI’s) that have engulfed the NHS, and the delegation of many health and social care services to Virgin Care, a private company. Consultants and managers with no local experience set targets and judge ‘performance’ by league tables. Patients are consumers. We heard it again this week at PMQs: Theresa May thanks NHS staff, says funding has gone up, and insulates herself from reality. Actually her government consistently shows contempt for those staff, and in real terms has stripped our health service to the bone. Jeremy Hunt comes across as so innocent, but it’s only because his policy actions are basically indefensible. For me, the best bit about high school was the school orchestra, the school production band and music concerts. I couldn’t have achieved academically without these opportunities to express myself and develop as a person. Those crucial years of school are where we grow. It’s a challenging time and is about so much more than grades. But not here, today. Since 2010 – and 2015 especially – the education system has become marketised, so that teachers are data machines and students customers. 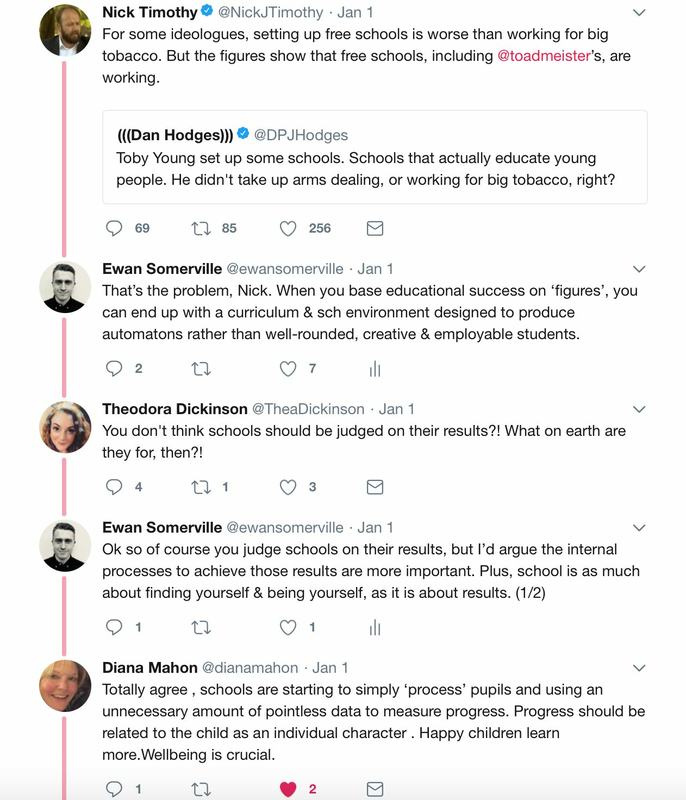 The impact was clear at my further education college: hollowed out, all about the A and A* grades, and offering little else. But they got a ‘good’ from OFSTED, so who cares? Now my high school (oh sorry, academy) has met the same fate. It’s what happens when an OFSTED inspection, based almost entirely on data, determines a school’s reputation. Where’s the money? It’s in a commitment to build 500 useless, pointless free schools between 2015 and 2020. It’s in PFI’s where local councils and dormant Local Education Authorities are paralysed to intervene. It’s in the corporatisation of senior leadership so principals are now also CEO’s. It’s in the salaries of ‘superheads’ like Sir Craig Tunstall. Creativity is nothing. Automatons are everything. Schools are washing their students’ clothes because the parents have no money. Schools are asking for donations from parents to continue. Universities are using student debt to pay for Vice-Chancellor salaries. Further education is hollowed out, forgotten. Teachers are so stressed they’re leaving. Talent is going down the drain, fledgling lives are being ruined. It’s been perhaps the most devastating legacy of this government, and highlights how taxing this free market dogma is on human life. The film I, Daniel Blake actually captured it well. By the government’s own figures, in the three years following the Coalition’s abdication of state responsibility for work-capability assessments to French company Atos in 2010, over 40,000 people died within a year of their decision. It’s what happens when untrained ‘medical professionals’ are tasked with assessing the most vulnerable in the interests of profit, not people. The calamity that is universal credit, leaving lives in limbo for weeks or months, is another way in which particularly the disabled have been demonised by think-tank dogma-driven policies. The UN has published reports calling Britain out for the violation of disabled peoples’ lives. People are earning their poverty, great lives are being ruined – many of them during retirement after a life of work paying taxes (taxes that many Tory donors avoid). For so many families in this country, not even Christmas could begin to address the degradation they feel; the loss of an irreplaceable dignity. Being a member of the ‘next generation’ in Tory Britain is degrading. It’s a dead place to be. So many are suffering, and their voices are suffocated.